2013 comes to an end with over 675 cities worldwide with operating 3rd generation bike-shaing services. From the largest cities to the smallest towns on 5 continents, bike-shaing is rolling as an intergral part of public transit. At the end of 2013, a global fleet of approximatedly 700,000 bikes are avaliable in 33,000 stations to use as another way to get from point A to point B. 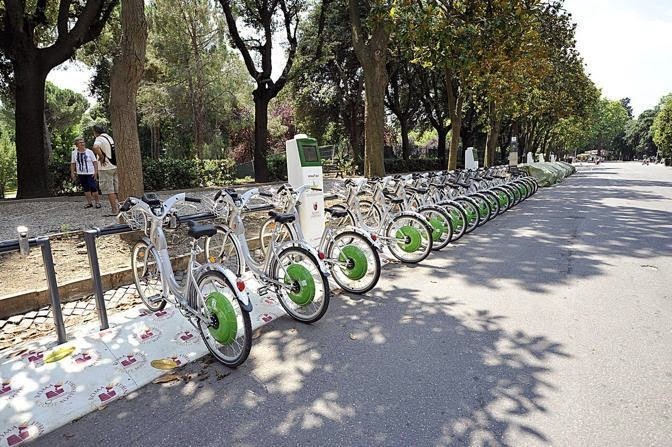 The winner for the most new bike-sharing cities in 2013 was: China! Listen to the handlebar bells ringing in celebration. China led the way with 65 new cities. Italy came in second with 20 new services. The USA came in third with 15 new cities -- which is a 90% increase over 2012. In 2013, both Cape Town and Johannesburg, South Africa started feasibility studies for bike-sharing. Soon every continent except Antartica will have bike-sharing services, but rumors are that the penguins are working to change that. In the last quarter of the year, China excellerated the opening of new services and the increase of the size of existing ones as a direct response to a blanket of pollution that is still covering the country. In the last week of December, four cities launched with over 1,000 bikes each. The Bike-sharing World Map for the end of December 2013, shows 678 municipalities with active bike-sharing services. 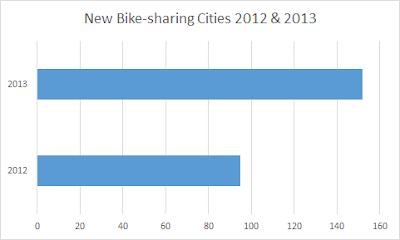 Also 186 municipalities appear as either constructing, planning, or actively studying bike-sharing. What can we expect to see in 2014? The growth of bike-sharing in Asia will not abate. It will still grow in China, but services will begin to be seen in Southeast Asia and the subcontinent. There will be continued growth of bike-sharing in South America. Buenos Aires, Argentina will add automated stations to its successful city service. The Mayor of Saõ Paulo, Brazil is calling for consolidation of that city's multiple services. All of the countires along the Andes spine are developing bike-sharing. Unfortunately, Australian bike-sharing is still hampered by the mandatory helmet laws. The services there just haven't been able to capture the usage numbers seen elsewhere in the world. Australia probably will not see much growth in bike-sharing until there is a change in the laws or an exemption for bike-sharing. North America will continue to have the same growth shown over the last year. Many third tier municipalities in the USA will start services. More Mexican cities will try to duplicate the success of the ever exspanding Ecobici in Mexico City. In Europe there begins to be more application of "pedelecs" (electrical assist bicycles) in bike-sharing. In 2014 both Madrid and Copenhagen-Federiksberg will have pedelec systems. In both Spain and Italy, older bike-sharing services are being updated with pedelecs. Milan annouced that it will add 1,000 pedelecs to its successful BikeMi. 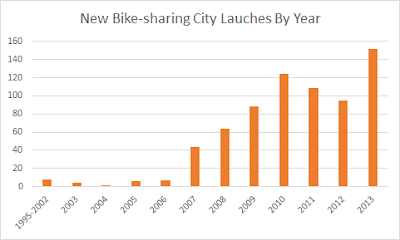 While 2013 was a big year for bike-sharing, it's very likely 2014 will be the start of a new era as new technologies develop and more municipalities implement the concept with their own unique flair. The statistics quoted above come from The Bike-sharing World Map. It is the premiere resource for information on cities with bike-sharing. The easy web address for viewing the map is www.bikesharingworld.com. See the O'Brien Global Bike Share Map which shows real time bike usage in many cities! The State of Victoria in Australia is looking to build Melbourne Bike Share into a public-private partnership with a sponsor that will expand the service from its roughly 50 stations into more parts of the city and suburbs in exchange for naming and branding rights, according to The Age newspaper. 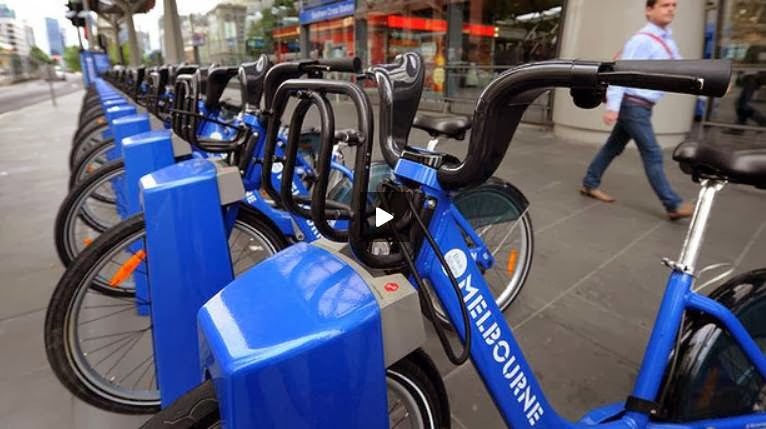 The Age states, "Bicycle Network Victoria's Garry Brennan said Melbourne Bike Share was currently too small and sparse and could not be viable without expansion. "Patronage has grown every year since the scheme was launched in 2010. It had its best-ever month in January, when 18,809 rentals were recorded. Last month there were 12,781 rentals, an average of 421 rides a day," notes The Age. The January record is just over 1 trip/bike/day with the roughly 535 bikes on the street.. Compared to Capital Bikeshare in the Washington, D.C. area where there are 300 stations, versus Melbourne's roughly 50, there was a record of 296,000 trips taken in August 2013. Even taking into account Capital Bikeshare being six-fold larger than Melbourne Bike Share, and the network effect of a larger service which leads to more trips being taken, this is a pretty marked difference. For Melbourne and the State of Victoria to let Melbourne Bike Share become the world-class bike transit service that it should be, Victoria could once again consider removing its helmet law for adults. It's holding back use of its bike transit system and in the desire to protect the public's well-being, may be an over-protective function which has a result of lowering physical activity as studies have suggestion, leading to an overall negative net result. Bike-sharing is a relatively safe mode of transport. In the USA there have been no fatal bike-share crashes in the country's short 5-year experimentation with the concept. 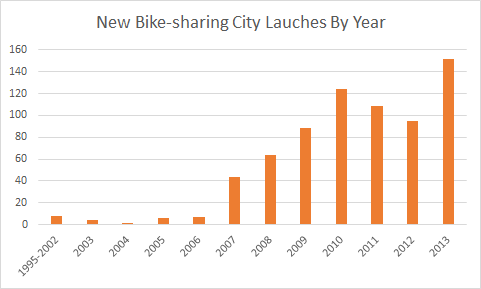 For comparison, Capital Bikeshare has 88 reported crashes in the 3 years since its inception a couple months after Melbourne Bike Share launched and over 5,894,375 trips. This is one reported crash for every 66,981 trips. Things aren't Top Hat up in Brisbane, Queensland either. The scheme has only had a little over 500,000 trips in its three years since October 2010. What should have been a financial benefit to the city hasn't materialized because of low ridership, according to The Brisbane Times. Changing the fare structure, tying payment with a transit card, and increasing the hours of operation haven't been able to overcome the damper that the mandatory helmet law does to ridership. Again from The Brisbane Times, Paul French, of the Brisbane Bicycle User Group, said his group is still hopeful the State Government would take on board the proposal for the scheme to be exempted from helmet laws. In other sponsorship news from the Commonwealth, Barclays has made public that it will not continue its sponsorship of the London Cycle Hire service in two years once its contract ends. This article from Mirror isn't clear whether Barclays sees the brand damaged after, sadly, a customer was killed by a tractor trailer -- being the service's first fatality in 3.5 years of operation. Or the sponsorship package changing as Transport for London's Graeme Craig states, "Cycle hire will become part of a much wider and larger cycling sponsorship offer encompassing cycle hire and the major new commitments made in the Mayor's cycling vision - new flagship segregated routes through the heart of London, new Quietway backstreet routes, along with cycle training and potentially other forms of active travel." Either way, looks like Boris Bikes may be getting a new paint job in two years. And I was just getting comfortable with Barclays blue. Now available, the month long delayed publishing of The Bike-Sharing Planning Guide from the Institute for Transportation and Development Policy (ITDP) has finally come after being announced at the Share Use Mobility Summit in San Francisco, California, earlier this year. Get a copy of this Planning Guide at www.itdp.org/library/publications/details/the-bike-share-planning-guide/. The statistic quoted above come from The Bike-sharing World Map. It is the premiere resource for information on cities with bike-sharing. The new easy web address for viewing the map is www.bikesharingworld.com.